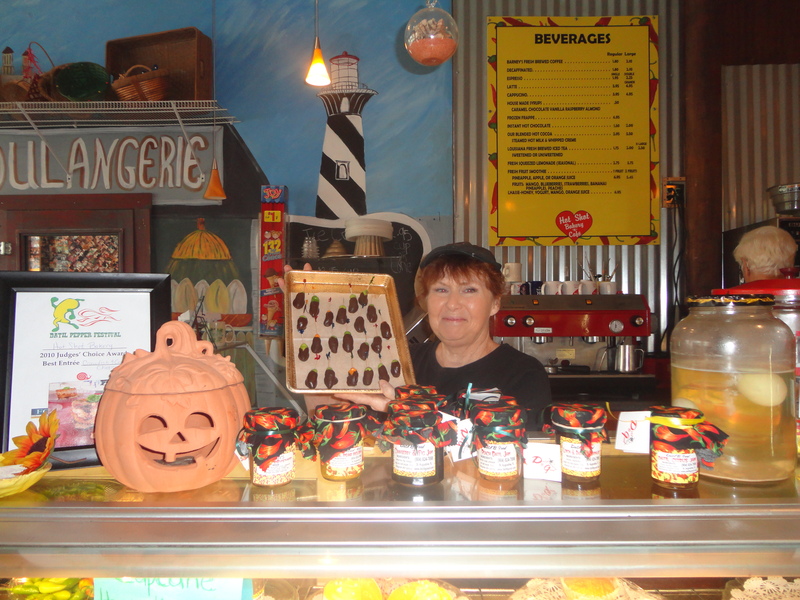 St. Augustine, Florida is the oldest city in the US and right in the midst of some of the marvelous historic sites sits Sherry Stoppelbein’s Hot Shot Bakery n Café. Rose Hammitt and I made a quick tour of St. Augustine before heading home from our Jacksonville Beach Florida trip. Rose was thrilled to visit a bakery and try out some good eats. The café is small but busy! On our stop I had a wonderful turkey and bacon Panini and Rose fancied the freshly made chicken salad. We both had to have desert and Rose selected a chocolate chip cookie and I chose a chocolate peanut butter concoction. If you go away hungry from this lovely stop, it is your own fault. We had to pack portions of our lunch for the road; we couldn’t put it all away. Sherry is of Minorcan descent. The Minorcans migrated to St. Augustine in 1777 bringing seeds of their Datil pepper which today is part of the St. Augustine culture. The story of the Minorcans in St. Augustine begins when the Spanish brought labor for the indigo plantation in New Smyrna. Eight ships with a group of Minorcans, from the island of Minorca which is located off the coast of Spain, were onboard. Minorca is the second largest of the Spanish Balearic Island. The islands are 50 to 190 miles off the coast of Spain and form a province of Spain. Minorca is small, only about 30 miles long and 10 miles wide. St. Augustine history states that the Minorcans believed themselves to be contracted as indentured servants to Dr. Andrew Turnbull, the indigo plantation’s owner; however, they were treated more like slaves. After nine long years, settlers that had escaped made their way to St. Augustine, where after hearing their tale of woe, the Minorcans came under the protection of Governor Patrick Tonyn. Today many of those settlers became the core of St. Augustine’s population. Rose took home a bottle of Datil Be Good hot sauce for her son-in-law who loves a little heat in his food. With full bellies and a true admiration for this charming chef, we headed back to Illinois with memories of the “Wall of Flame” great food and a new knowledge of Minorcans and Datil pepper! For more information about the Hot Shot Baker or Datil Be Good sauces, log onto www.hotshotbakery.com.